Since his release last year after spending six-years in a Malaysian prison, Anwar Ibrahim has become a darling of the West for his promotion of an understanding of Islam that is regarded as ‘moderate’ and West-friendly. ABDAR RAHMAN KOYA in Kuala Lumpur reports. Anwar Ibrahim, the former deputy prime minister of Malaysia who was freed in September last year, is almost synonymous with contemporary Malaysian politics. He was once a student-leader, well known among Islamic circles throughout the world; his rise and fall have been followed closely by his friends and by activists. When he was dismissed, arrested, jailed and convicted on contrived charges, many Muslims in Malaysia and those concerned with the Islamic movement saw the process as the nature of secular politics. Even more, many in the global Islamic movement were not surprised by the drama that engulfed Malaysia’s political scene from September 1998, when he was dismissed, to his release from prison exactly six years later. During these tumultuous times Anwar Ibrahim has emerged as an icon whose personal and political experience brought together all types of people – the Islamists, the ‘moderates’, and even some parties whose anti-Islamic agenda is difficult to conceal or deny. One fact has to be acknowledged: Anwar is politically very skillful, and quite capable of making a comeback. Whether this is because of his charisma and leadership, his political shrewdness, or even due to his attention-capturing oratory skills, is another matter. He is now increasingly hailed as a “moderate” in some western circles; his diary is filled with speaking engagements in academic and political institutions that are either in the West or funded by the West. Not surprisingly, “inter-civilisational dialogue”, the subject that has no risk attached for politicians seeking a good image among Western leaders, is one of his themes wherever he goes. Probably as a result of this development, many in the Islamic movement have doubts about Anwar’s sincerity to the movement, despite his background as a ‘radical’ Islamic student leader whose impact on the Malaysian political scene has been immense in the country’s recent past. These doubts are valid, and his recent statements and actions have further fuelled these suspicions. His recruitment by Mahathir in 1981 for the latter’s “Islamization policy” earned him friends and foes: many saw in him a mastery of political skill, in other words a man for all seasons, wearing the right hat for every occasion. Considering that he was touted in the seventies as a “radical Muslim” leader, and his supporters once stormed the US embassy, AnwarIbrahim’s plunge into a different mould of ‘Islamicity’ has been as dramatic as his rise in Mahathir’s cabinet. With such a history, it is difficult for the Islamic movement to ignore him, and even more difficult for the Islamic movement – or the ‘Islamists’, as the current parlance is – to not know him. These days, Anwar Ibrahim is globetrotting, with most friends in high places (governments and thinktanks in various countries) welcoming him, despite the fact that he has no official post in Malaysia’s government at the moment. In the US he has delivered many lectures in his newfound capacity of spokesman for “inter-civilizational dialogue”. Immediately after his release he was greeted in Munich, Germany, where he was being treated for spinal injury, by none other than Paul Wolfowitz, the architect of the US war on Iraq. Thus began the repackaging ofAnwar Ibrahim: he ceased to be the rousing leader that he had been until 1998, and has become someone whose friendship with western mentors – to whom many would-be leaders in southeast Asia link their political destiny – is invaluable to Westerners in their desperate search for “agents of change” in the Muslim world. At the very least his image-building, from the way he dresses to the cautious statements he makes about the US and western hegemony, has earned him the status of a Western “darling”. In typical fashion, a variety of words is being used in western circles to describe him: he is a moderate, a thinker, a reformist; he is a liberal Islamist, an Islamic democrat; terms that Anwarhimself might be uncomfortable with, but for whose use on him he has no one to blame but himself. Who Anwar’s friends really are remains the biggest question since his release: such a question could be ignored in the spirit of international diplomatic realities when he was at the top echelon of government. But now that he has no political post, one is left wondering why he is meeting with people like Wolfowitz, and being welcomed at the Pentagon. Clearly, he is being groomed both in Washington and by western journalists as a “voice of moderate Islam”. On April 11, at a conference in Qatar, organised by the US-Islamic World Forum (a body funded by several American interests) Anwar Ibrahim said that he had “conceded” that the US attack on Iraq heralded a new beginning for the “voices of freedom”, and disagreed that it was a war against Iraqis or Muslims. As if that were not enough to please Uncle Sam, Anwar is on record as expressing support for Paul Wolfowitz’s nomination to head the World Bank, against which even the US’s European allies have protested. His various ‘self-critical’ statements, now fashionable among Muslim ‘moderates’, side by side with mild chiding of American policies, lend credence to the supposition that this is the man that the West is grooming to head one of the most vibrant Muslim governments in the world. Dr Muzaffar Iqbal has best described this phenomenon: ‘moderate Muslims’ of the “self-critical type”, who, as he wrote, “repeat their favorite mantra: ‘we must stop blaming others for our misfortune, the problem lies within us.’ This is precisely the kind of ‘openness’ and ‘inward-looking approach’ desired by the US. These ‘Muslim intellectuals’ are the darlings of Washingtonbecause the Americans want us to believe that we are being bombed back into the stone age because of our own faults.” (See “The West’s intellectual agents in the Muslim world”,Crescent International, October 2004). Anwar Ibrahim now appears to be a leading “agent of change”, as far as the West permits: he is talking about democracy in the Muslim world but stops short of criticizing his friends in the Arab world, especially the Saudi ruling family, with whom he has enjoyed cordial relations since the days when the Saudis were campaigning in the Muslim world against the “Shi’ite” Revolution in Iran. For the Malaysian opposition, particularly for the Islamic Party (PAS), which is aligned closely to the People’s Justice Party (Keadilan), led by Anwar’s wife, this stance chosen by the man whom they have endorsed openly as prime-ministerial material poses problems, with many leaders in the opposition (and even Anwar’s wife) choosing to brush it aside as Anwar’s “personal views”. The opposition is at a crossroads of a sort: Anwar is an asset because of his ability to bring in extra votes, but could become a liability because of his ties to western political interests, coupled with his pro-US opinions. For PAS, long seen as the flag-bearer of the Islamic movement in Malaysia, Anwar should have been no different from many ruling-party leaders campaigning to counter PAS by propagating “Islam Hadhari” (“progressive Islam”) – the political theme of prime minister Abdullah Badawi. Anwar is busy promoting “democracy and change” among Muslims, and thus jeopardising what remains of his Islamic credentials. The state of the Islamic movement in Malaysia today is by and large a product of the 1998 saga. Anwar’s ordeal resulted in odd partnerships in the Malaysian opposition, with both Islamic and anti-Islamic elements joining forces to form a coalition to win elections. PAS felt it had no choice but to join the bandwagon, lest it be accused of not seizing the moment when many non-Muslims had turned to it for some form of leadership in their opposition to Mahathir. Similarly, outside Malaysia, human-rights organizations, religious figures, European leaders and the most hawkish of American personalities came to Anwar Ibrahim’s defence, partly because of his years of establishing a wide network of supporters. Now as his judicial ordeal in Malaysia fades into the past, so does western criticism of Malaysia, a country whose economy offers great prospects of profit for western investment. This is partly because of the Malaysian government’s engaging public-relations experts not only for foreign-investment purposes, but also to present itself as a moderate Muslim country. Its support for the ‘war on terror’, offering logistical and moral support to Washington despite its loud anti-American noise, has also brought the Malaysian leadership back into the good books of American lobbyists, who in turn influence policies in Capital Hill. Anwar Ibrahim, the man whom Washington now apparently favours to lead this southeast Asian Muslim country, is now in the opposition even if he refuses to hold any party post. But theUS and its western thinktanks are in no hurry: the present leadership is able to deliver, but for the ‘war on terror’ to generate tangible results it needs a man with the necessary combination of qualities: Islamist yet pro-western, and therefore easy to deal with – to succeed gradually in the top echelons of government. 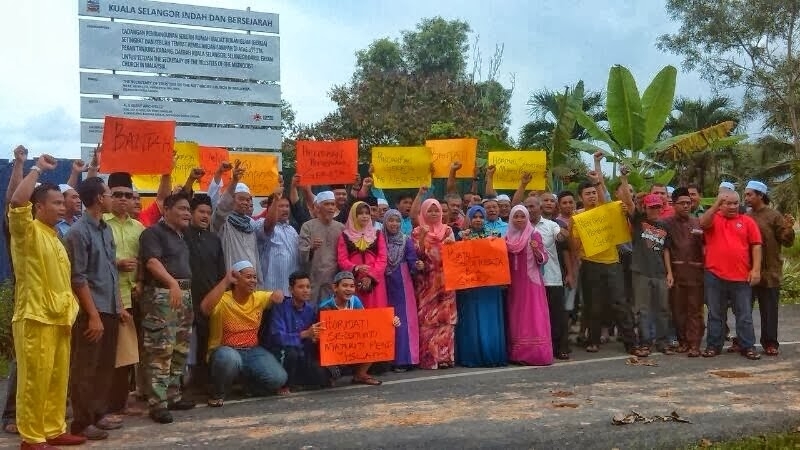 The implications of all this on Muslims in Malaysia are already visible: western thinktanks and local NGOs funded by western interests are already engaging the opposition, particularly PAS, in various issues which do not concern ordinary Muslims directly. These include such things as “personal freedom”; some sections of an emerging class of secular elites have called for the powers of Islamic enforcement-officers (mild compared to their Middle Eastern counterparts) to be abolished. This non-issue came up when children and relatives of some politicians were arrested recently for consumption of liquor and other unIslamic behaviour at a discotheque in Kuala Lumpur. These groups have also tried to persuade the government to establish a so-called “inter-faith commission” so that all religions will be consulted on national policies. The sudden rise of these ‘liberal’ demands has to do with the steady emergence of secular elites among the Malay Muslims, most of whom have ties with ‘royal families’ and powerful politicians in other countries, in much the same way as Pakistan’s disco-generation and Turkey’s secular elites have tried to justify their unIslamic lifestyles, while at the same time curtailing the Muslims’ freedom to choose their own destiny. One thinktank, the Friedrich Naumann Foundation, based in Germany, which has been sponsoring political programmes for the opposition, has even prepared a platform for PAS, on one side of the fence, and several NGO representatives, on the other, to debate issues raised by these groups. Such marketing-style seminars and forums to ‘engage’, ‘tame’ and infiltrate the Islamic movement are common in many other Muslim countries, and are a clever distraction for the Islamic movement, to prevent activists’ attention from focusing on more urgent issues. One can argue that in Malaysia’s case, PAS needs to be ‘tamed’ because it is an integral part of the opposition and cannot be isolated, in preparation for Anwar’s return to government. Anwar’s visits to several institutions in the West, such as to Oxford University and John Hopkins University, can also be read in the same way: a public-relations exercise to impress uponWashington that the Malaysian opposition is “friendly”. Speaking at John Hopkins in Washington early last month, Anwar hinted that some form of Western pressure should be applied in order to ease the opposition’s burden (remember that such pressure is already seen in places like Lebanon and Venezuela). Anwar expressed regret for Washington’s recent praise of the Malaysian government: “It is mockery even when Washington, for example, approves this sort of exercise [‘undemocratic’ practices] because it just portrays your utter ignorance or inconsistency in dealing with such countries,” he told the audience (italics added). Although it is not entirely true that PAS is reviewing its position on the Islamic state, it is a fact that it has failed to propagate it with wisdom. Since Mahathir rebuilt his image after 1998,PAS’s influence has steadily declined. This was made worse by the death of Fadzil Noor, whose leadership of PAS had ensured that the party kept its ideal intact yet worked with others to bring about reform and change. Many disgruntled leaders and others hitherto aligned with the ruling elite had joined PAS. A few of them have risen in the party to occupy key posts. These are businessmen and professionals who are well known among government circles. Yet their contribution to disseminating Islam – to lay the foundation of an Islamic state or doda’wah in a multireligious society like Malaysia – has been minimal. Much of the party’s resources have been geared towards winning elections, which it could not have managed anyway because of the strict campaigning and election rules. The absence of a capable leadership in PAS is probably one reason why it has in effect left its direction to Anwar. PAS is now increasingly being sidelined in debates that affect Muslims in the country, and its leaders’ responses to the challenges being brought by the so-called ‘liberal’ camp have been dismal. Its arguments are almost all within a national political framework, such as the replies it gave when these ‘liberals’ questioned the enforcement of morality among Muslims. PAS president Abdul Hadi Awang merely warned them against transgressing the federal constitution and the powers of the sultans. PAS’s survival as an Islamic movement to voice the ethos of Islam in Malaysia may be at stake, as it increasingly finds itself trapped in the system it chose to be in, and seeks to ‘re-brand’ itself. It seems that it now wants to survive as a ‘market-friendly’ political party, and do so by aligning itself with Anwar, who many expect will be the prime minister. This may well result in long-term (if not irreparable) damage to the Islamic movement, and risks turning the only Islamic movement in the country into a Turkish-type ‘Islamist’ political party that exists mostly in the ballot-box and for little else.